New nurses may find themselves a bit shocked once they hit the professional world. After spending as many as four years studying every waking minute, you finally have some time to yourself again! Even more experienced nurses can get caught up in their routine and forget to take some time to enjoy the small things. It’s normal to feel the need to fill up your extra time and even feel a bit guilty if you don’t. But it’s important to remember that you deserve a break! You are working hard each day to care for others and earning those days off. Furthermore, it’s a documented fact that taking some time to unwind improves productivity. So sit back, relax and take a look at these suggestions for how to spend your days out of the scrubs. 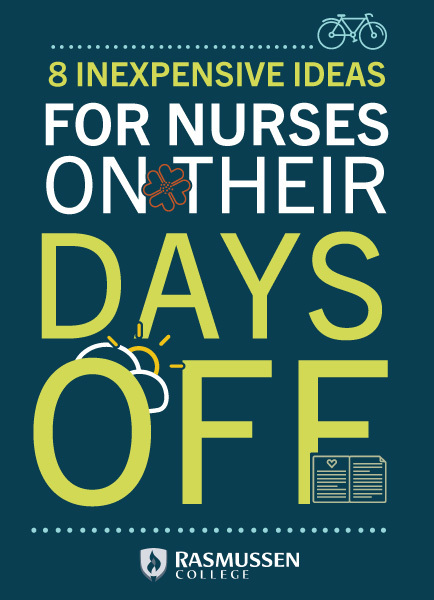 We’re going to wean you off the busy-nurse mindset slowly by starting you off with some ideas that will pass the time but still give you opportunities to gain some valuable experience. These ideas are fun and will look good in future job searches. Charitable work is a great way to fill a morning off. There are a ton of options from serving food in a soup kitchen, walking dogs at an animal shelter or even committing to long-term program like Big Brothers & Big Sisters. Find something that matches your interests and you will look forward to your days off. Mentees aren’t the only ones who benefit from mentorships. Being a mentor gives a person the opportunity to grow their own leadership skills, network with other nurses and foster talent in an organization. There are several national organizations like the American Nurses Association, as well as regional groups broken down by discipline. Nursing organizations are valuable to join because they coordinate regular networking opportunities as well as options for continuing education. Sometimes it seems that the more hours you spend at work, the more chaotic things can get at home. Take some time to get a plan for your household so that it’s easier to stay organized. Take an afternoon to plan out your meals and grocery lists for the month. This will not only help you free up more time for the fun stuff later on, but it will help you stick to healthy choices. Put together a laundry organization system so that you can complete that tedious chore with ease. Use your nursing triage skills to create bins that make sense for you: delicate & regular, or whites, lights and dark colors. Leave your cares behind, you deserve it! You can’t spend every single day being productive, however, or you’re going to get burned out. For ideas that offer a little bit more distance from “work-like” activities, look no further. It can be tempting to turn on the latest reality TV show if you are spending a day at home, but try something different and head over to the library instead. You know you will get into the book as soon as you start reading it and studies show books are much more effective at improving your mood and relieving stress. You don’t have to take a 4-day trip to the Bahamas to feel like you’re escaping reality a little (although that is always nice too). Try visiting a local park for a picnic or taking a stroll around a lake. Maybe there is a festival a few hours away that you have never been to. Today is the day to try it. Nurses spend a lot of time on their feet. If you can’t afford a full-blown day at the spa, make an appointment for a pedicure at a local salon. Even pedicures include a small foot massage and your feet will thank you for taking 30 minutes to show that you still love them when you’re working the next 12 hour shift. About the Author: Katy Katz is a content creator for Collegis Education. She enjoys writing education and career focused articles to help individuals find their place in the work force. She also regularly contributes to a nursing career blog at Rasmussen College. Connect with Katy on Twitter and Google+. The views and opinions expressed on this blog post are solely those of the original author. Their views and opinions do not necessarily represent those of Uniform Advantage’s staff, and/or any contributors to this site. ← 5 Quick and Easy Red, White & Blue Treats!